There’s no mistaking a change in our rock pools this week. There’s a new chill in the Cornish sea breeze. The shrill cries of swallows swooping over the water and children jumping the waves will soon fall silent as the days shorten and the autumn gales brew. The seas, however, are bursting with life. 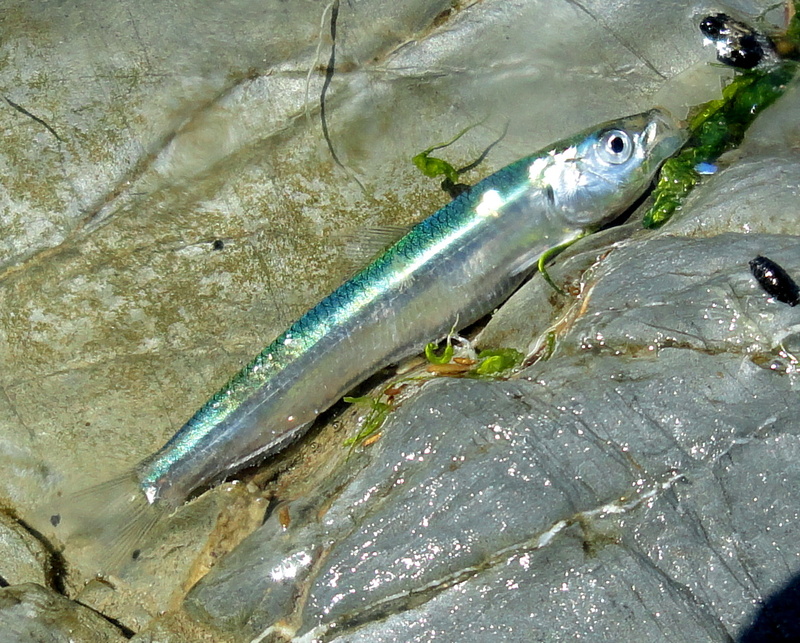 Young fish and Sand smelt are roaming the shallow waters in their thousands and they often become trapped in pools as the tide goes out. The high temperatures and low oxygen in these small pools mean that many die, providing a feast for the herons, egrets and gulls. 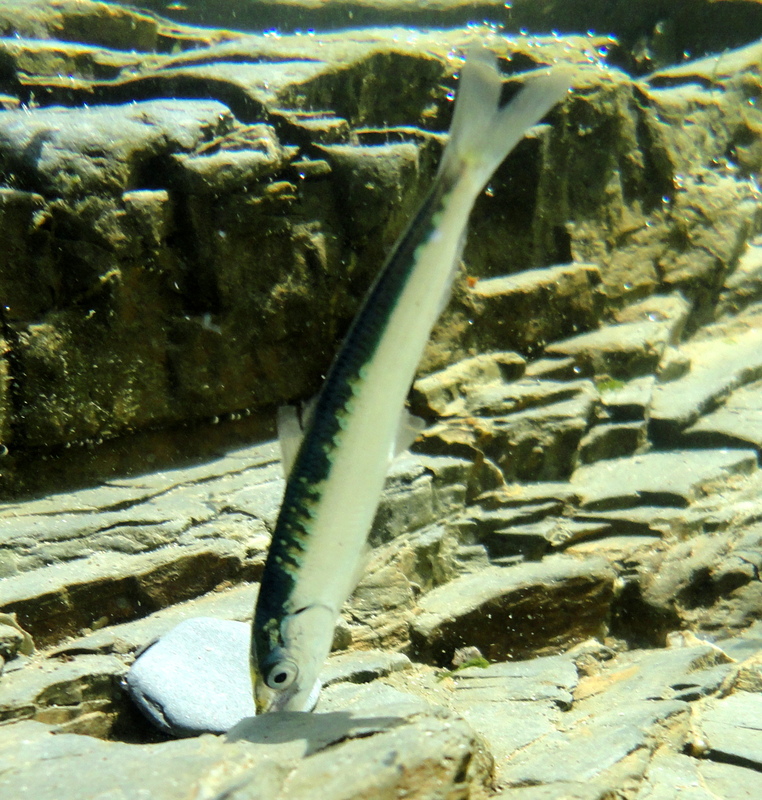 Mackerel are stalking the shoals into the shallow waters, as close as they dare to the beach, to gorge on these easy pickings. As the predators move in, the young fish jump for their lives making the surface of the sea boil and froth with fish. It’s a tough time for young fish, but some will survive and grow to renew the cycle. Walk up to the tideline and you may find some more shipwrecked souls. By the wind sailors (Velella velella) are being carried onto our beaches by the wind. These relatives of the jellyfish look like tiny blue discs, with a transparent sail on top and short blue tentacles underneath. 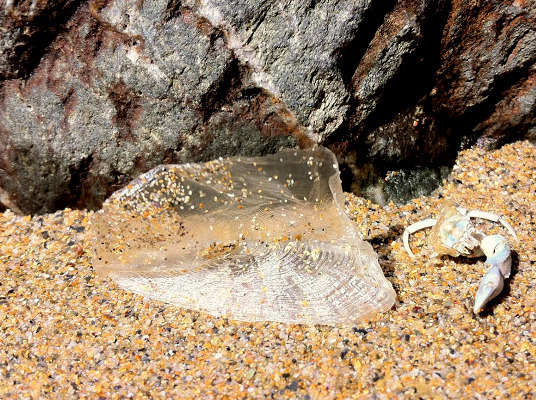 On the shore they dry out, turn transparent as cellophane and blow around in the wind. Great armies of these small creatures float around the ocean surface all summer. They can be ‘left’ or ‘right’ sailed and they will always be carried in the same direction as the wind so animals with the same sail direction stay together on their travels. They have no other means of propulsion so many become stranded on our beaches. Read more about By the Wind Sailors on the Marine Life Information Network. The height of the season is by no means over in our seas – water temperatures don’t normally peak for another couple of months so it’s a great time to see exotic visitors. This year’s jellyfish bloom may well attract higher than usual numbers of Leatherback turtle to our shores. These huge turtles weigh up to one tonne and follow their jellyfish prey all around the Atlantic Ocean from their nest sites in the Caribbean. They have already been spotted off the beaches of Cornwall this year, so keep your eyes peeled. As their name suggests, their shell is flexible and has a ridged, leathery appearance, which makes them easy to distinguish from the hard-shelled turtles. Turtles are especially vulnerable to ingesting plastic waste, which can block their digestive system and cause starvation – a good reason to join local beach cleans and to give up plastic bags if you haven’t already. Should you find a stranded or dead turtle, please contact the Cornwall Wildlife Trust’s Marine Strandings Network. It will soon be time to pack away my shorts and beach shoes for another year, but that’s no reason to stop rockpooling. In many ways our rock pools are at their most impressive and surprising during the winter storms and spring migrations. The seasons of wellies and waders are coming and I, for one, can’t wait.